In the movie’s opening shot, the camera sits in the dark interior of a cabin as the silhouette of Martha Edwards (Dorothy Jordan) moves to the door. Both Martha and the camera look out into the bright sunlight at a distant horseman—Ethan Edwards (John Wayne), her brother-in-law. It’s 1868, supposedly on the Llano Estacado of Texas. 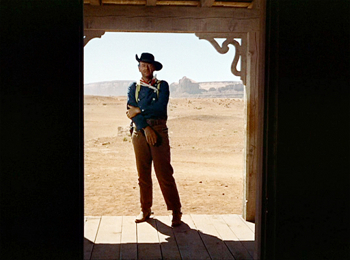 We can tell, however, that it’s shot in John Ford’s favorite location, the Monument Valley on the Utah-Arizona border. Edwards has been away at the War Between the States, and it’s taken him three years after the war to find his way back to what home he has. As he greets his only living relatives, he kisses Martha on the forehead, and we sense that some of his distance is caused by his warm feelings for his brother’s wife. It’s never more explicit than that, though. Similarly, we’re never really told what he’s been up to for the three years since the war ended, except that he didn’t go to California and he has $180 in freshly minted Yankee gold. The implication is that he never surrendered (“I don’t believe in surrenders”), and he’s been outlawin’ somewhere. Just as he’s getting reacquainted with his family, up rides a band of Texas rangers led by Capt. the Reverend Samuel Johnson Clayton (Ward Bond), with a neighbor whose cattle have been run off by Indians. Ethan and young Martin Pawley (Jeffrey Hunter), an Edwards foster son whose parents were killed by Indians when he was small, join the rangers and take off in pursuit. Martin (Jeffrey Hunter) and Ethan (John Wayne) begin their search. The cattle raid was just a ruse, though. The Comanches double back and hit the Edwards place, killing the parents and young son and taking captive the daughters, Lucy and Deborah. After the initial chase, the rangers get called to other responsibilities, and then it’s just Ethan, Martin and young Ben Jorgensen (Harry Carey, Jr.), Lucy’s beau, on the trail of the raiders. Early in the chase, Ethan finds Lucy’s body and buries it. When Ethan is forced to tell Ben, Ben goes crazy and is killed attacking the Comanches by himself. Now it’s just Ethan and Martin on an odyssey that will take the next five years. Periodically they drop back in on the Jorgenson ranch, where it develops that Laurie Jorgensen (Vera Miles) and Martin have feelings for each other, although Martin’s never around enough to do anything about it and Laurie gets increasingly desperate. Over time, Ethan and Martin figure out which Comanche band has Debby and try to catch up with it. Ultimately they do, more than once. Martin inadvertently acquires a Comanche wife, Look, and she suffers the fate most Indian wives do in westerns (see Jeremiah Johnson and Little Big Man, for example). This may be a plot centering on how the chase is conducted over five years, but it’s principally a character study of Ethan Edwards, all edges, absolutes and internal conflicts. He doesn’t concede that Martin has any actual relationship to any Edwards, although they’re all the family the boy has known. Martin has some Cherokee blood, which Ethan doesn’t like; he keeps calling the boy Blanket-head. Ethan won’t swear an oath to the Rangers because he’s already sworn one to the Confederacy. When he and Martin are attacked by venal trader Jerem Futterman and two henchmen with robbery in mind, Ethan doesn’t mind shooting them in the back as they’re trying to get away. They’re bad guys and that’s all they deserve. 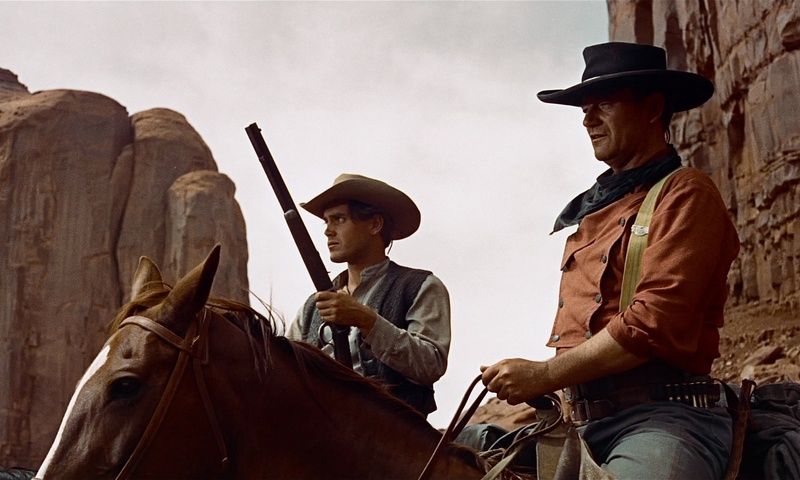 The camera work emphasizes Ethan’s obsessive qualities: When he’s aiming at Comanches with his rifle, he can almost kill them by his look without pulling the trigger. 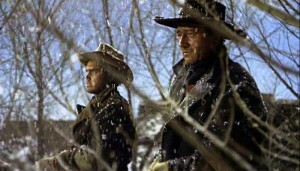 In a winter scene, Ethan and Martin check out white female captives the cavalry has recently taken back from the Comanches. They’re kept in a rough chapel at a cavalry post. None of the rescued women appears to be stable mentally, and as Ethan walks to the door to leave he turns suddenly and looks at them. In the dim room we can barely see his eyes under the brim of his hat, but his look is obsessive and filled with anger and frustrated purpose—excellent acting and a brilliant shot. Ethan surveys a group of recaptured white women and children. It becomes more apparent to Martin that Ethan means to kill Debby (Natalie Wood, then 18) when he finds her. She’s been sullied by living too long among the Indians and has been defiled by her relations with them. In one of their brief encounters, Laurie makes Ethan’s case for killing Debby to Martin as she attempts to persuade Martin to discontinue the chase and stay with her. That was likely an accurate attitude for the time, although one that this movie doesn’t really share. 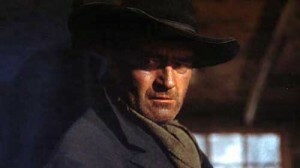 The movie depends on Ethan, and John Wayne plays him superbly—so much so that it’s hard to think of any one else in the role. (Maybe a younger Tommy Lee Jones—Jones can play this kind of implacability, as he did with Woodrow Call in Lonesome Dove.) This also has one of Ward Bond’s more colorful parts, and he makes the most of it as he repeatedly rides in and out of the plot. (As he gives the order to attack: “Brethren, leave us go amongst them.” “Mount! M-O-N-T-E, mount!”) Mrs. Jorgensen is played by Olive Carey, widow of one Harry and mother of another, and she’s good in the very limited requirements of the part. At the time Jeffrey Hunter was an up-and-coming young actor, and he’s good enough here. Hank Worden plays Mose Harper, an addled scout, and it’s one of his better roles. 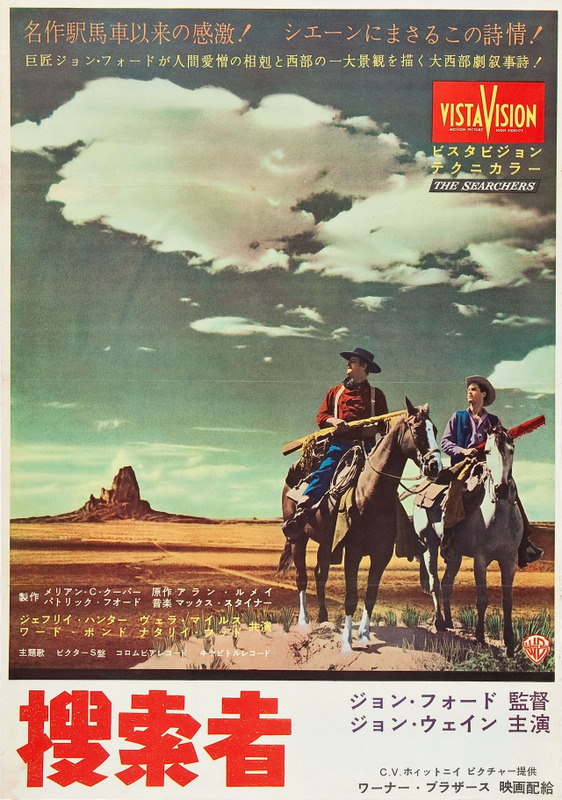 A 15-year-old Patrick Wayne makes his significant film debut as a young cavalryman. The clunky note in the cast is Ken Curtis, who plays Charlie McCorry, a young Ranger suitor of Laurie’s. Although his dialect may be authentic, it simply sounds like he’s having trouble talking around his teeth. German actor Henry Brandon as Scar looks very imposing, and Scar is played as an intelligent and courageous leader, if one, like Ethan, filled with and perhaps crippled by hatred. Ethan changes some by the end, regaining a bit of his humanity. But the closing shot is a bookend of the opening shot. The camera is inside the dim Jorgensen cabin, looking out the front door into the sun-lit landscape. Walking in the sun and through the doorway toward the camera, Mr. and Mrs. Jorgensen take the newly-liberated Debby into their care. Next come Martin and Laurie, moving into the cabin the same way. As they enter the cabin interior and walk past the camera, that leaves only the figure of Ethan standing on the porch looking in, holding his right elbow with his left hand in perhaps the most memorable single image from the film (Wayne said the posture was an homage to Harry Carey). He watches for a moment, seemingly with a touch of longing, then turns and walks out into the bright sunlight—to what future we have no idea. Presumably he has more peace now, but he still doesn’t belong with regular people. The direction is John Ford at his best: Low camera angles in the Monument Valley emphasize the rock formations, the sky and John Wayne’s looming size. There is brilliant use of light and dark in interior shots. The editing shows remarkable and very effective restraint in the attack on the Edwards cabin; after setting the atmosphere by showing the fear of various members of the Edwards family, the only element of the attack shown is Comanche chief Scar (Henry Brandon) finding the very young Debby (Lana Wood) huddled by her grandmother’s grave. In a current western, it would be hard to imagine not showing the violence, but the effect of doing it Ford’s way here is to emphasize the off-screen violence’s effect on the characters and especially the violence within Ethan Edwards. There’s a lot of information in this movie conveyed without dialogue, so watch closely. The cinematographer was Winton C. Hoch, who had won back to back Oscars in 1948 and 1949, as well as in 1952. The music by Max Steiner involves the usual Ford Americana themes: Lorena, Bonny Blue Flag, Garry Owen, etc. The participation of the Sons of the Pioneers now seems a bit old-fashioned, like the comic relief. 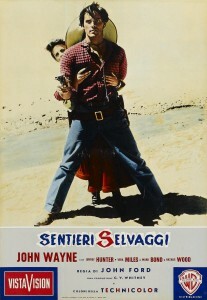 Based on a novel by Alan LeMay, the screenplay was written by frequent Ford collaborator Frank Nugent (nominated for an Oscar for his work with Ford on The Quiet Man). 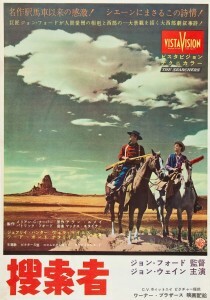 For an extended discussion of both (a) the historical roots of the story (the Comanche capture of Cynthia Ann Parker as a child and her ultimate tragic recapture 24 years later), and (b) the making of the movie in the 1950s, see The Searchers: The Making of an American Legend, by Glenn Frankel (New York, Bloomsbury, 2013). It has been said that another historical influence on this story was Brit Johnson, an African-American teamster who spent years in a successful quest to find and ransom his kidnapped wife and daughter from the Comanches, then almost immediately set off again to find and rescue yet another child kidnap victim. Brit Johnson was killed by the Kiowas. This entry was posted in 55 Greatest Westerns and tagged Jeffrey Hunter, John Ford, John Wayne, Native Americans (Indians), Ward Bond on September 16, 2013 by Nicholas Chennault.